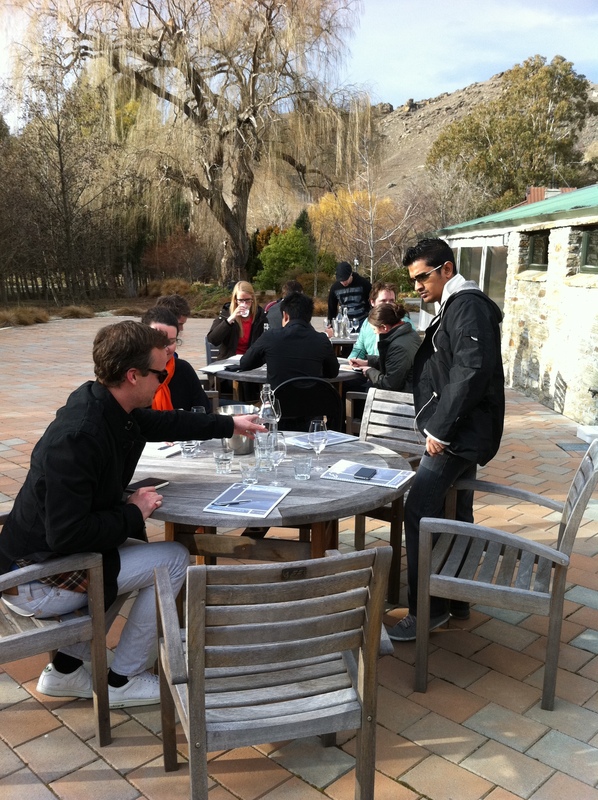 Every year Central Otago Pinot Noir Ltd (COPNL) hosts a select group of wine professionals. Over four days our guests are immersed in Central Otago and gain a unique insight into the wine, the people and the stunning Central Otago landscape. An experience they will never forget. Many new relationships are established and renewed. This year we enjoyed hosting a lively group of influential wine professionals including some of the top sommeliers and fine wine consultants from Sweden, Germany, Singapore, Sydney, Melbourne, Auckland and Wellington. One of the themes we look at is the influence of each Central Otago sub-region on Pinot Noir character. Within Central Otago each sub-region has a slightly different climate due to its distance from the Southern Alps, altitude and the local geography. To look at the sub-regions our guests travel as a group, getting into the vineyards, talking with the people who grow the grapes and make the wine, and tasting a selection of wines grouped in a way to show off the local sub-region. During the event all four vintages of Grasshopper Rock Pinot Noir were tasted. 2007 and 2008 were part of a sub-regional line up, 2006 was served at a lunch and 2009 at a dinner at the Cardrona Hotel. The highlight for me was the Alexandra sub-regional tasting. The venue was a secluded function centre in Conroy’s Gully. Conroy’s Gully is near Grasshopper Rock vineyard and in the late 1800s was an important gold mining area. Now it can claim to adjoin the southern most Pinot Noir vineyards in the world. After a stimulating few days everyone goes back to their real jobs but we have two exciting Pinot Noir events to look forward to with Pinot Celebration 2012 and Pinot Noir 2013.